Losing weight is hard, so why make it harder by eating bland food? Instead of cooking up an unseasoned chicken breast or noshing on raw celery, delve into your pantry for spices that can help you lose weight. From spices as simple as black pepper to one of our favorites, turmeric, here are eight common spices that will help you shed those pounds. According to researchers in South Korea, piperine, a component in black pepper, helps block the formation of new fat cells. While this study showed what might happen if cells are introduced to concentrations of piperine 100-times higher than what a human could consume and keep in their bloodstream, integrative nutritionist Dr. Barbara Mendez states it can help prevent weight gain and often recommends it to her clients. Black pepper also boosts the bioavailability of turmeric, another spice that may help you lose weight. This means your body can absorb turmeric better with pepper’s help. So, it’s a good idea to sprinkle black pepper on your dish, especially if it contains turmeric. Cardamom offers a wealth of health benefits, depending on your needs. It appears that it can help treat intestinal spasms and gas by increasing the movement of food through the digestive tract. It can also help boost the appetite in anorexic patients. When it comes to weight loss, cardamom is considered a thermogenic spice, meaning it helps raise the body’s temperature. This, in turn, helps the body burn fat more efficiently. According to Ayurveda, cardamom helps digest “ama,” a sticky toxin that is produced during indigestion. It is said that ama blocks microchannels in the body and slows down the metabolism. It appears that the science confirms what Ayurvedic healers have claimed all along. Another thermogenic spice, cayenne pepper will certainly put some zest into your meal. Like cardamom, cayenne helps raise the body’s temperature, which leads to a faster metabolism and therefore, weight loss. The active ingredient in cayenne, capsaicin, has been shown to reduce fat around the middle, especially in people with a high BMI. Dietician Dr. Lauren Minchen states that adding this spice alone to your meal can help you burn an extra 100 calories as you eat. Other studies find that the spiciness of pepper might help curb your appetite, which is a bonus for anyone trying to lose weight. Studies have shown that cinnamon has multiple health benefits, including weight loss and lowering your risk of heart disease. It’s useful for the treatment of minor digestion issues, and researchers at Ball State University found that it even helps lower blood sugar levels and bad cholesterol (LDL) levels, without affecting good cholesterol (HDL) levels. High blood sugar is one of the leading causes of weight gain. Cinnamon helps reduce blood sugar levels naturally as it imitates insulin’s activity and increases insulin levels naturally. It also helps to slow down the process of food moving to the intestine. As a result, cinnamon can help you feel full longer, leading you to eat less food overall. Researchers at Shahid Sadoughi University of Medical Sciences in Iran found that cumin helps reduce body fat and improve unhealthy cholesterol levels. The study also found that cumin helped reduce triglycerides, or harmful fat in the blood, by 23 points for the test group, as opposed to the control group’s decreased triglycerides by five. Cumin contains phytosterols, chemicals found in certain plants that help inhibit the body’s absorption of cholesterol. It’s possible that other foods that contain phytosterols may have a similar effect. Garlic has long been known for its nutritional value. It can help reduce blood pressure and inflammation, both of which increase the risk of disease and speed up the aging process. According to a study from Seoul, Korea, garlic also aids in weight loss and lessens the effects of unhealthy food on the body and liver. Another study conducted by Dr. David Mirelman of the Weizmann Institute in Israel found that garlic helped reduce symptoms of diabetes and reduced plaque build-up in the coronary arteries of subjects. Gingerol, a component of ginger, helps with weight loss and improves blood sugar levels in the body, according to a 2014 study published in the Journal of the Science and Food of Agriculture. Its effectiveness has been compared to common weight-loss medications and it may also help increase levels of good cholesterol (HDL). Studies have also shown that ginger increases leptin levels in the body. Leptin is a protein produced by fat cells. Its job is to communicate to the brain that the body’s energy levels are correct — essentially that you have enough fat and energy stored to prevent starvation. When ginger increases leptin levels, the brain is tricked into thinking that your body is storing more fat and it can burn it off more efficiently. Turmeric has many health benefits including the reduction of inflammation and weight loss. Curcumin, the active component of turmeric, helps prevent the accumulation of fat in the adipose, or fat, tissues of the body. It also helps reduce the amount of fat stored in the stomach and liver. Not only does curcumin prevent fat from collecting in the body, it also helps reduce the current amount of fat tissue in the body. You read that right: turmeric helps you lose the excess weight you already have and keep it off. It can also help you lose weight quickly when you’re on a diet. Which of these common spices is your favorite? 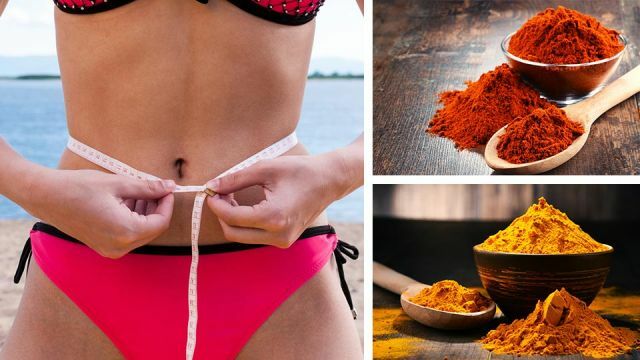 Hey Buddy!, I found this information for you: "These 8 Common Spices Can Help You Lose Weight Fast". Here is the website link: https://www.thealternativedaily.com/8-common-spices-that-help-you-lose-weight/. Thank you.